Udupi, June 26, 2017: State JD(S) Chief and former chief minister H D Kumaraswamy has claimed that he was a genuine farmer while Chief Minister Siddaramaiah was not so. Speaking to media persons during his visit to the Krishna Mutt on June 25, Sunday, he said he has toiled as a farmer before his entry into politics. CM Siddaramaiah has no genuine concern for farmers, he alleged. On the CM not accompanying the President during his recent visit to Krishna Mutt, Kumaraswamy said it was nothing but a loss to the CM himself. He also said that the JD(S) would support Meera Kumar who will be the opposition candidate for the post of President. 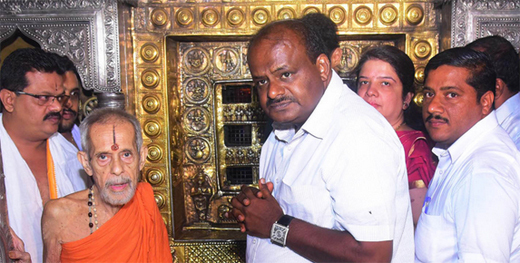 Kumaraswamy, his wife Anita and son Nikhil offered prayers at the Krishna Mutt and later sought blessings of Pejawar seer. Udupi District JD(S) Chief Yogish Shetty, Women’s wing leader Shalini and others were present .